For her groundbreaking research on Rett syndrome and other neurological disorders. 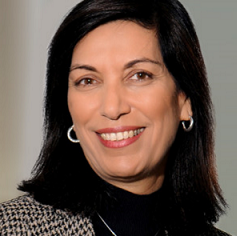 Zoghbi's specialties are pediatrics, molecular and human genetics, and neurology and neuroscience. One of her earliest major discoveries, in collaboration with Harry Orr, PhD, was the first genetic mutation behind a spinocerebellar ataxia, a hereditary and often fatal brain disorder that impairs a patient’s ability to control movement. In later work, she found that a gene called Math1 plays an important role in the formation of neurons in the brain’s cerebellum and spinal cord involved in balance and proprioception (awareness of the position of one’s body), inner ear hair cells critical for hearing, as well as brainstem neurons essential for breathing, balance, and hearing. Her lab showed that uncontrolled growth of the cerebellar neurons contributes to brain tumors and that removing the gene stops tumors from developing. She also identified MECP2 as the gene responsible for Rett syndrome, a neurological disorder that affects brain development, leading to severe problems with cognitive and motor functions. As the first to prove that the disease is genetic, her work opened up a new line of research on mutations that cause neuropsychiatric disorders such as autism. Now a professor of pediatrics, molecular and human genetics, and neurology and neuroscience at Baylor, Dr. Zoghbi has devoted her career to uncovering the genetic roots of rare neurodegenerative and neurodevelopmental diseases that affect her patients. In 1996, she became an investigator at the Howard Hughes Medical Institute. In 2010, she was named director of the Jan and Dan Duncan Neurological Research Institute at Texas Children’s Hospital. Dr. Zoghbi’s scientific findings, featured in more than 350 publications, have touched many areas of medicine and inspired myriad other investigators. Her many honors and awards include the March of Dimes Prize in Developmental Biology and the Gruber Foundation Neuroscience Prize. She is a member of the Institute of Medicine, the National Academy of Sciences and the American Association for the Advancement of Science. Dr. Zoghbi earned her medical degree at Meharry Medical College in 1979. At Baylor, she completed a residency in pediatrics, fellowships in neurology and pediatric neurology and a postdoctoral fellowship, before joining the medical school’s faculty in 1988. She also holds honorary doctorates from Middlebury College, Meharry Medical College and Yale University.